Art collectors will be kicking themselves, especially if they are in New York as it has been revealed that famous British street artist Banksy had a stall set up in New York’s Central Park and sold original, signed works for only $60 – the equivalent of less than £40. The works are estimated to be worth around $20,000. 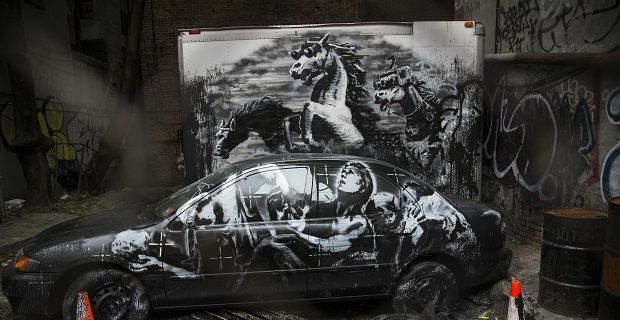 Banksy is in New York on a month long residency and providing a public art show entitled “Better Out than In”. The reveal was made via a video of the day’s events which were recorded and posted on his website (www.banksy.co.uk). The stall was manned by an unknown older man who sat and waited for hours before the first sale. Eventually a lady purchased two of the pieces for her children – and even managed a 50% discount. That must be the bargain of the century! The next sale was to a New Zealand lady who bought two of the art works and finally a Chicago man walked away with four original pieces after he decided that following a recent house move he needed something for the walls. With only four customers for the day the total takings were $420 (just over £250) and most of the works were packed up at the end of the day and presumably brought back to their elusive owner. The stall will not be returning as Banksy confirmed it was a one off. As part of the “Better Out than In” show Banksy has promised new art in the form of graffiti, street sculpture, video installation or substandard performance art each day during the month of October. So far he has presented The Sirens of the Lambs – a meat truck filled with stuffed toys peering out the back of the truck and touring the meat packing district – as well as a heart shaped balloon covered in bandages in Brooklyn.